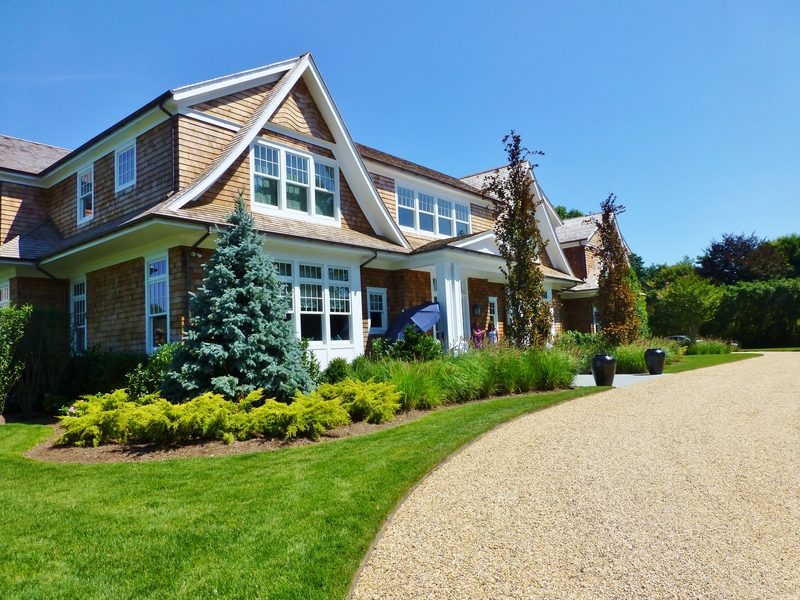 The stunning shingle style house has many eaves and a lovely front porch. A gravel drive is typical in the Hamptons…I think it lends a certain vintage appeal, don’t you? 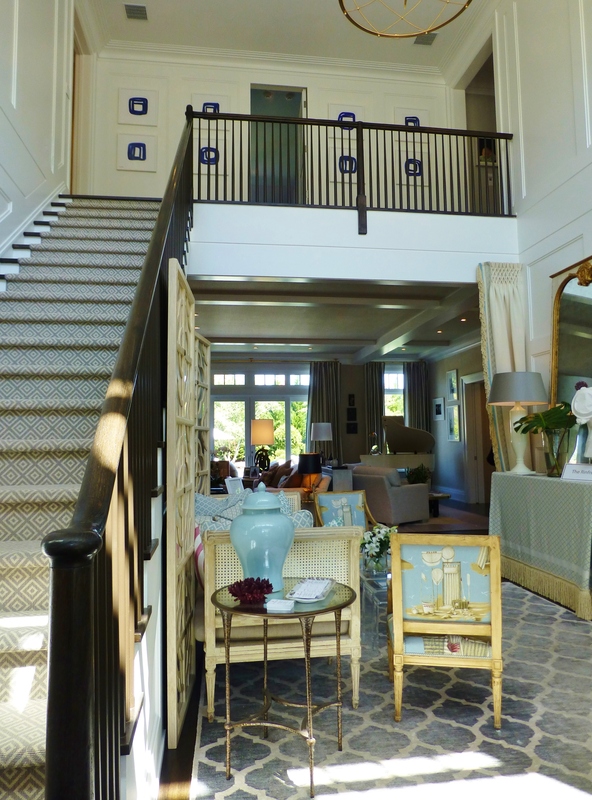 Well, it’s finally here…the first of several posts about the 2014 The Hampton Designer Showhouse. This designer house was my whole reason for making the lengthy trip up Long Island for the first time. 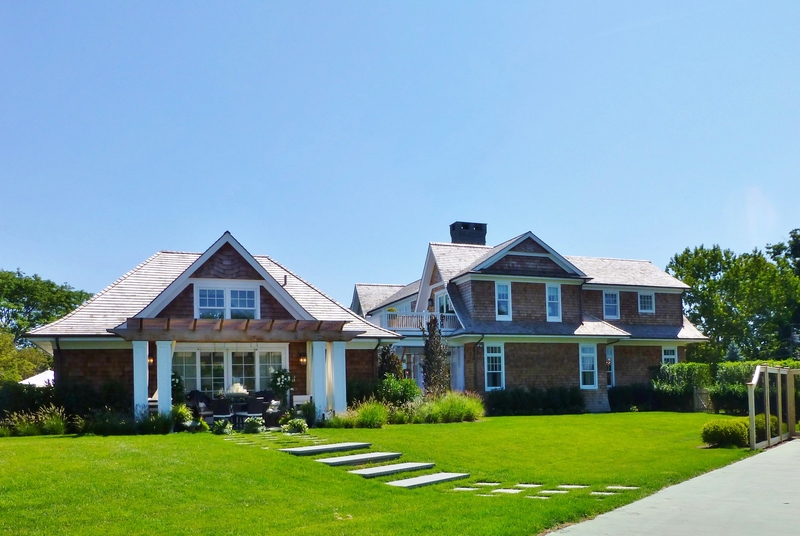 I’m so glad I did visit “The Hamptons”, because the 2014 showhouse was truly amazing! Even though I had already seen online photographs of many rooms in this shingle style mansion, experiencing it in person was so phenomenal! 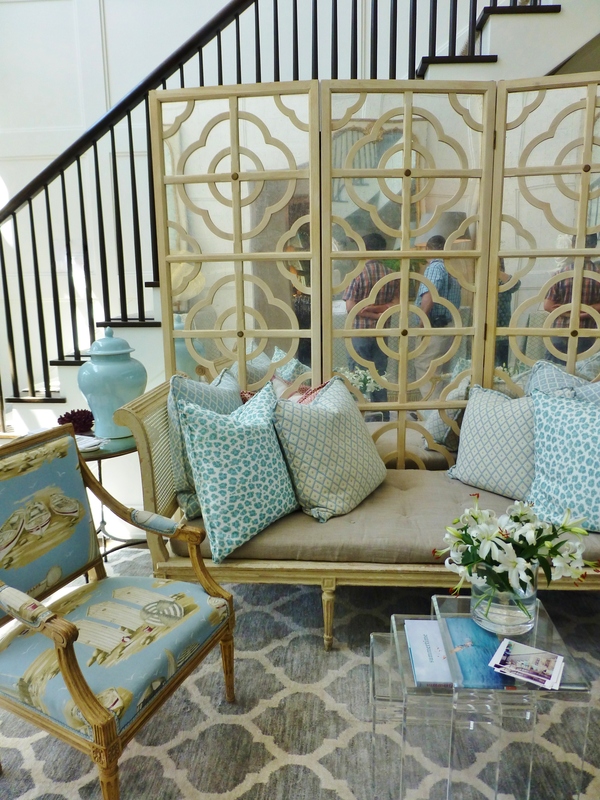 Our main reason for visiting the Hamptons was a tour of the fabulous Hampton Designer Showhouse. This is a side view of the main house (at the right) and the pool house (to the left). Parking was on the tennis court (from which this photograph was taken) and then we walked around the front to enter the main house (seen at your right). Just inside the front door is a foyer sitting area by The Rinfret Group. The grey and ivory geometric stair runner coordinates beautifully with the large grey trellis area rug below. By the way, the upstairs hallway, which you can see a little in this image, is designed by the Mark Humphrey Gallery. The sitting area features a beachy color scheme of blue-grey-turquoise and ivory with gray. I especially admire the tall mirrored dressing screen, which anchors the seating group visually and repeats the trellis motif in the carpet. The eclectic combination of vintage style furniture (like the French Chair and Rattan Daybed) with the Lucite tables and updated area rug is a nice touch too! On the opposite side of the entry hall is this elegant skirted table with inverted pleat corners. The designers also included a single custom drapery panel with smocked heading and layered passamenterie (seen at the left) to further divide the space from the main living area beyond. I was surprised to see the long, chunky Bullion fringe used on both the drapery and the skirted table…fringe and other large-scale trims have not been as widely used lately–I’m hoping it’s coming back into fashion! This gold bullion fringe really adds a lot to these fabric treatments, don’t you think? And did you notice that statue atop the right side of the skirted table? 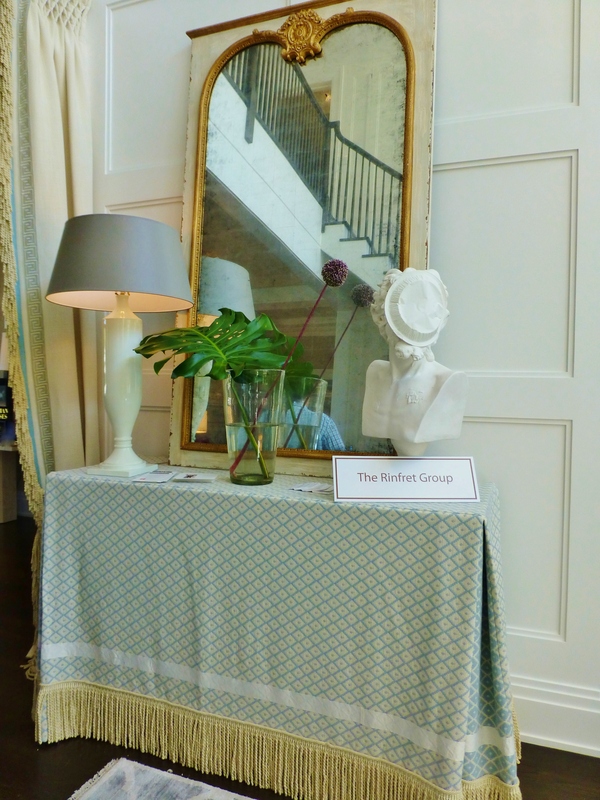 It’s a large Grecian bust–with a pie on the face! This white traditional statue, with a twist, is so silly and unexpected…I just love design with a sense of humor, don’t you? The powder room off the entry had a charming globe-shaped chandelier with rings of crystal and capiz shells and the mirror over the sink vanity featured artfully arranged seashells. 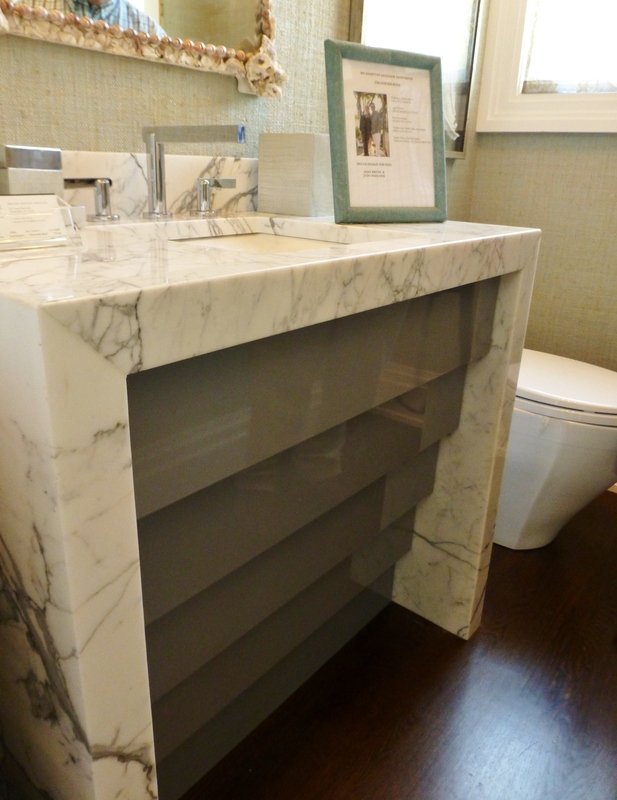 The vanity in the powder room was made with a chunky waterfall-style marble top and had this interesting gray stepped front. This sink base is very sleek and clean-lined. It has an Art Deco Ziggurat vibe to me…I like it! Even the faucet is streamlined and angular. 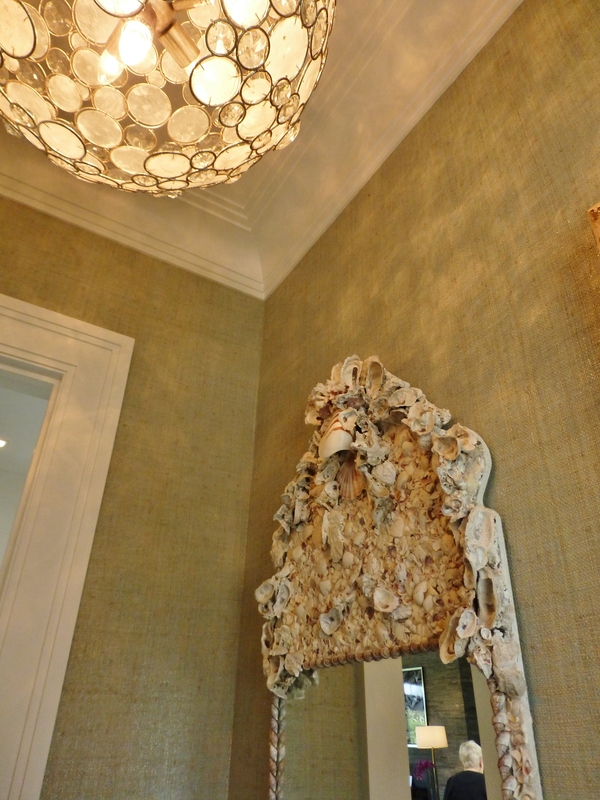 The walls in the powder room were covered in a textural metallic grasscloth. 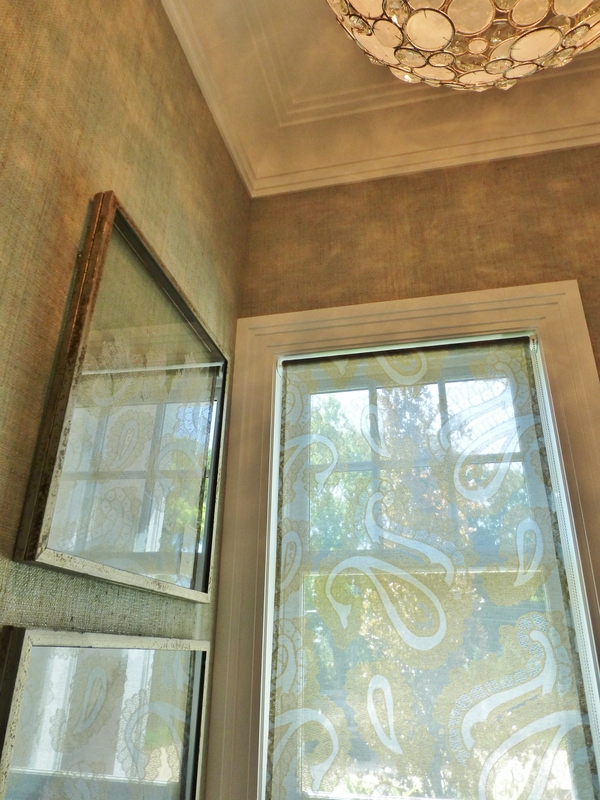 The single window features a truly beautiful roller shade with a metallic paisley sheer fabric. I think roller shades are making a real come-back and they are so practical! This one is stunning. You’ll also notice the window’s stepped Ziggurat-style casing and the cove crown molding at the ceiling, both of which are found throughout the house. Again, they have a very sleek, art deco feel. I’ll leave you there for today…next time we’ll travel on into the dramatic dining room of the 2014 Hampton Designer Showhouse (also designed by Mecox Design Services). It’s a real stunner featuring many innovative ideas! Until then, please feel free to leave your comments…what did you think of these first two rooms? They’re just a fraction of what’s in store… Please share my blog with everyone you know…I need all the friends I can get! This entry was posted in Architecture, Designer House, Designers, Interior Design & Decorating, The Hamptons and tagged Art Deco, Decorating, Entry, Foyer, Long Island, Mecox, powder room, Rinfret Group, Robinson interiors, Showhouse, Sink Vanity, Wallpaper. Bookmark the permalink.